Non-aerating means air is not mixed into the water stream, as it passes through the showerhead; as a result, less temperature is lost between the showerhead and you. Flow Control Technology means you will have consistent, even pressure regardless of water pressure; in fact, it means greater force at low pressure. 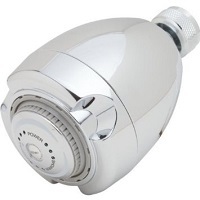 9-jet turbo massages mean you enjoy the feeling of a higher flow, luxury showerhead at home. In a nutshell, it means you will get superior performance, along with greater water temperature and flow control, while enjoying maximum energy savings.